A Moscow court has turned down the state prison service's request to replace opposition leader Alexei Navalny's suspended sentence with a jail term. Observers say the decision was politically motivated – it is not advantageous for the powers-that-be to jail Navalny. A Moscow court has turned down a request from the prison service to replace a five-year suspended sentence earlier given to opposition figurehead Alexei Navalny with a jail term. 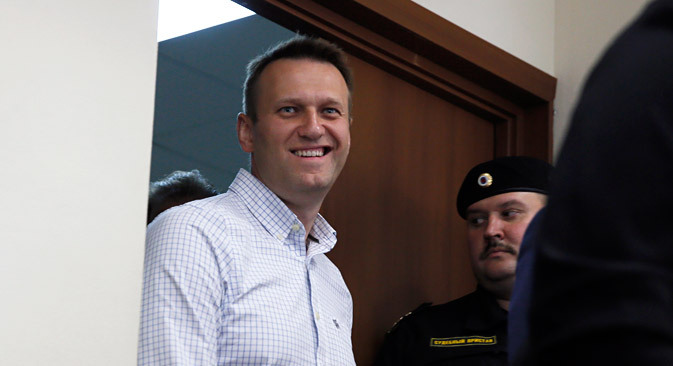 On Wednesday, May 13, the court decided not to uphold the request by the Federal Penitentiary Service (FSIN) to change Navalny's suspended sentence into jail time in the so-called Kirovles embezzlement case (the verdict was announced in 2013; the politician received five years). His existing probation order was instead extended for three months. The FSIN had requested a prison term for Navalny based on an incident in February 2015 in which the opposition politician was jailed for 15 days after being caught in the Moscow subway distributing leaflets calling on city residents to join an anti-crisis march titled “Vesna” (Spring). At the time of distribution, the protest had not yet been authorized (it failed to take place in the end), so Navalny's actions were regarded as an administrative offense – urging people to come to an unauthorized protest. By law, such violations are indeed grounds for changing a suspended sentence into a jail term, but only in case of systematic perpetration. The court ruled that "systematic" meant the commission of the offence more than two times, whereas Navalny was deemed to have committed exactly two violations. After the suspended sentence was upheld, the politician described the "endless trials" as a test of public reaction to his possible placement in a detention center, as well as a form of pressure on his Progress Party (the party had its state registration withdrawn at the end of April) and his Anti-Corruption Foundation. "I have no illusions,” Navalny wrote later, “they'll come up with something in the near future again – [accusing me of] crossing the street in the wrong way, reporting [to the probation officer] in the wrong way or looking askance at people. Or they'll just launch a new criminal case." On the following day, May 14, another hearing against Navalny was held. The FSIN's new request was met; the politician was obliged to report to the probation officer on certain days of the month, instead of at his discretion. Navalny is also serving a sentence in the so-called Yves Rocher embezzlement case – a suspended three-year-and-a-half prison term (the verdict was announced in December 2014). His brother Oleg Navalny received three and a half years in a penal colony in the same case. Both cases are widely seen as lacking substance and being politically motivated attempts to publicly discredit the man who has become the chief representative of Russia’s opposition movement. However, Alexander Pozhalov, director of research of the Institute of Socio-Economic and Political Studies, which has close ties to the Kremlin, dismissed the idea that the decision not to jail Navalny had no political agenda. "[Navalny's recent court hearings] are a routine process, which has no hidden political motives," said Pozhalov in an interview with RBTH. According to him, the FSIN is simply performing its function – it is obliged to draw the court's attention to an offense and the possibility of changing the measure of restraint, or the service may be accused of non-compliance with its obligations. "The court fulfilled its function in exactly the same manner; it found that violations did take place, but they were not systematic," said Pozhalov. But Yevgeny Minchenko, director of the independent International Institute for Political Expertise, told RBTH that “Navalny has a desire to be imprisoned, while the authorities are seeking not to imprison him, in order that he not look like the Russian Nelson Mandela that he wants to present himself as." According to Pozhalov, the current situation, in which ordinary protest activists receive actual jail time (for example, those convicted of riots on Bolotnaya Square in Moscow in 2012), some of Navalny's associates are under house arrest or have fled the country, but a "softer position" is applied to the politician himself, which is "not a winner for some leaders of the opposition" in general. Arguments about political pressure and the testing of public opinion are attempts to "explain this strange situation," he said. Yet Mikhail Korostikov, an analyst from independent research center Kryshtanovskaya Laboratory, argues that Navalny's cases are "exclusively about political expediency" and "not about some legal matters." In the current conditions of sanctions, recession and international confrontation, "it would be excessive" for Russia to aggravate its position in the international arena by "jailing the biggest opposition leader," said Korostikov. "The state would not gain any advantages from this action, it would not have improved the president's rating, whereas shortcomings would have been very noticeable," he added.